Jumma activists protest surrender of arms by Shanti Bahini to Bangladesh government. 1997. Shantu Larma and Sheikh Hasina let go a peace dove into the sky to celebrate the 1997 CHT “Peace” Accord. Why are there quote marks around “Peace”? Why do Jumma activists insist on this distinction? Didn’t peace come to CHT? Didn’t we reap the peace divided. This is the Accord that ended the two decade long guerrilla war by Shanti Bahini for autonomy in the Chittagong Hill Tracts. One side kept their word. The Shanti Bahini laid down arms and demobilized. Well you know the story of how our government kept its word. 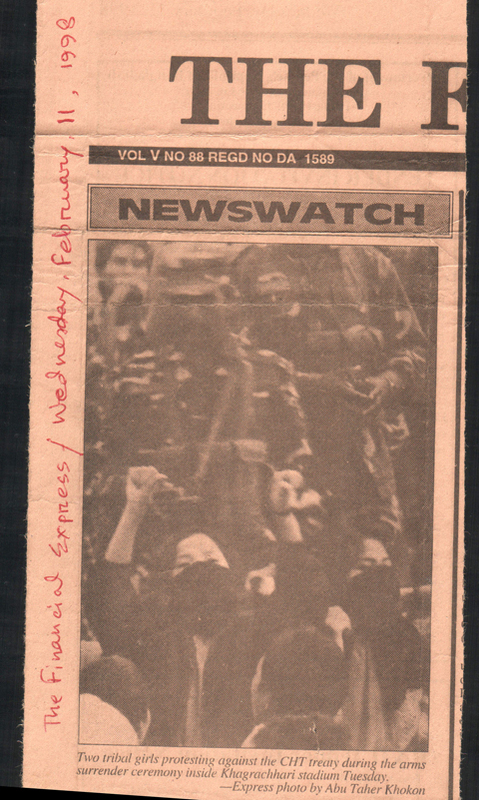 Even in 1997, there were already dissident voices among Paharis, who said that Shantu Larma had signed an accord that Bangladesh government would NEVER HONOR. That dissident led to the birth of UPDF, which broke apart from the Shanti Bahini and formed a new party. Thus we have PCJSS and UPDF as two main Pahari parties of CHT today. 16 years later, the dissenting words proved to be bitterly true as the Accord remains unimplemented by two AL governments and one BNP government. This photo is from a protest by Pahari (Jumma) activists. 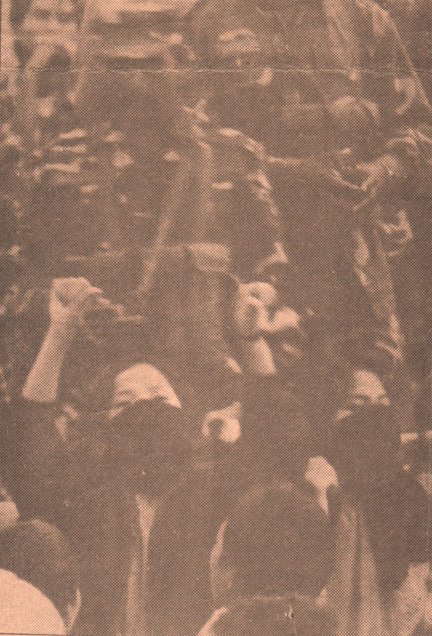 Raising their fists in protest against the arms surrender of February 10th, 1998. In front of the military. Lest we forget our own histories.